Over the last months I've gotten compliments and questions on how I created the SteelSeries gauges and how I hooked them to the Xively (pachube -> cosm -> Xively) API. First, let me give credit where credit is due. I didn't create the SteelSeries gauges, Gerrit Grunwald did. He has a great blog here <link> where he describes the various displays he's created. I stumbled across them a while back and hooked them into my Xively data feed to display the last updates so I would have a nice display of current power usage and temperature. They worked really well and look great. It took a little work to get them going, but it was well worth it. Basically, I query Xively for the last value, then give it to the gauge to display. 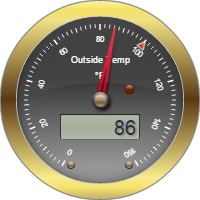 Here's the current (a minute ago) temperature at my house in the Arizona, USA desert. Edit: This used to be a live gauge, but I replaced it with a picture. There's too much up there to try and explain each item; this blog post would go on forever. However, there's lots of documentation on the web that can explain what I did and the SteelSeries library has enough in it to get you started there. Good luck and have fun with it. I'll be showing how I use the Google Graph API in an upcoming post as well. Excellent! Thanks Dave. That makes things alot clearer. I ended using emoncms but since these gauges use json I bet they can be used with emoncms too. I gave up on emoncms as a permanent repository. They don't allow cross site operations, which means you can't get the data back if you have a script from a different machine. That makes it pretty useless except for the graphs they provide. Of course, you can put the data on a machine of your own and use their software, but I want to control my power, not run a data center. I asked about this on their forum, and never got an answer that was appropriate; so I just gave up. Thinkspeak allows this and so does Xively and Sen.se. Strange that they don't. Dear Dave: my congratulations for your fantastic job! It is amazing. I just came across the SteelSeries gauges and I would like to ask you how can I use them to display data that is posted in a .txt file ? In example, I have sensors reporting data and writing them in a plain text file, like, power in Watts, Temperature, Voltage etc. How can I use the gauges to show the values on my page? The data is updated each 15 seconds. I can try to help you. Basically, first you want to get the gauge to appear on an html page on your computer first. Just create html file, with an editor and stick everything I have up there in the code box in it. Load this file with your browser by just double clicking on it. The browser should start (if it isn't already running) and load the file. You should see the gauge I have up above on your screen. Now you need to edit it to make it read your data instead of mine. So you replace the ajax stuff with a file read to get the data you want and the setValueAnimated() call is where you put the number you get from the file. A setValueAnimated(70) will move the needle to 70 in a sweep instead of a jump so it looks like a real gauge. Saw your picture of the gauge. It's nice, I may have to play around with the settings on mine the darker metal look is nice. I wanna change titleString's font size to be bigger. How could I do this? You probably can, but I can't remember the parameter. Take a look at Gerritt's site, he lists the parameters there somewhere. It took me a bit to find them, so look around.